“He had high fever and suddenly he started having fits. His body was vigorously moving and nothing could hold him down. He stopped moving all of a sudden. I thought he was dead at that point. Now all I can do is wait for the doctors to give me some positive news about his health. 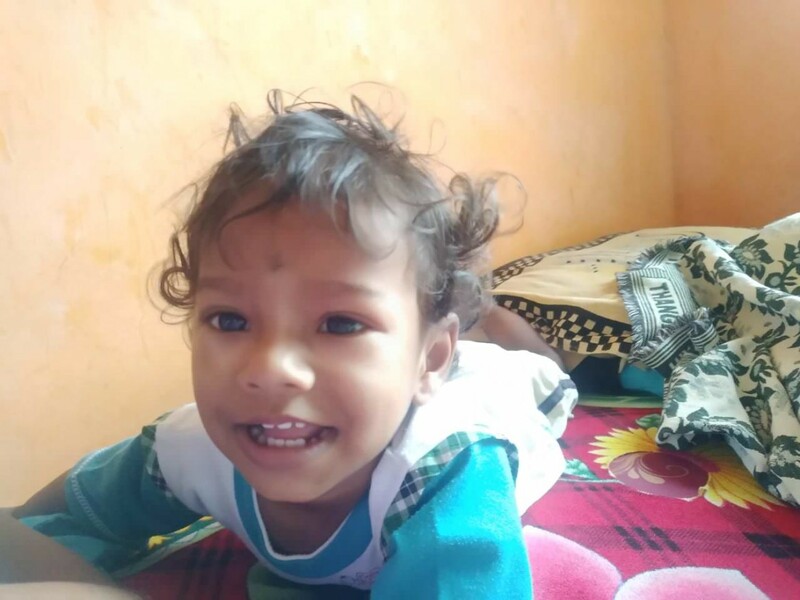 I know we can’t afford his treatment, but I just want my baby to be alright”-Suganya, mother of 6-month-old Yadesh. 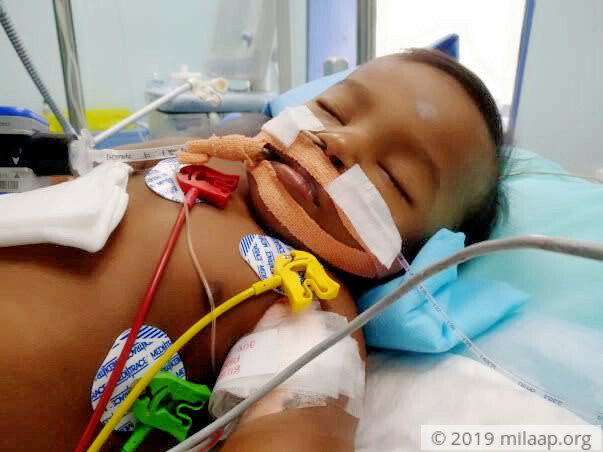 Yadesh did not have any major health problems that caught the attention of his parents before this. His mother still cannot understand how a fever could put her dear baby in such a serious condition. He had suddenly stopped breathing and was very drowsy – that is when they rushed him to a good hospital in Chennai. He had low blood supply and his haemoglobin levels suddenly dipped. He also developed pneumonia. “What scared us the most were his seizures. Seeing a small baby have fits is a sight no parent should see in their lifetime. When the doctor told us that he has to be on the ventilator because of his low oxygen levels, we did not know what to think. 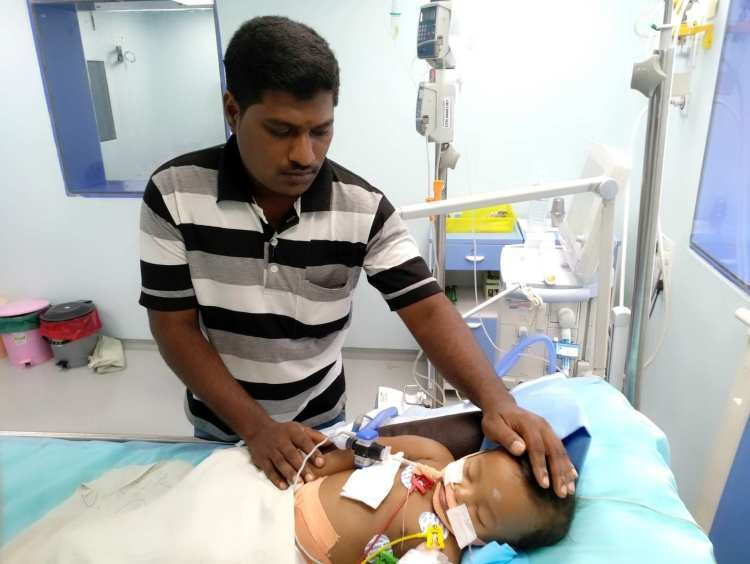 For poor, uneducated people like us, ventilator and all means grave danger”-Raman, Yadesh’s father. 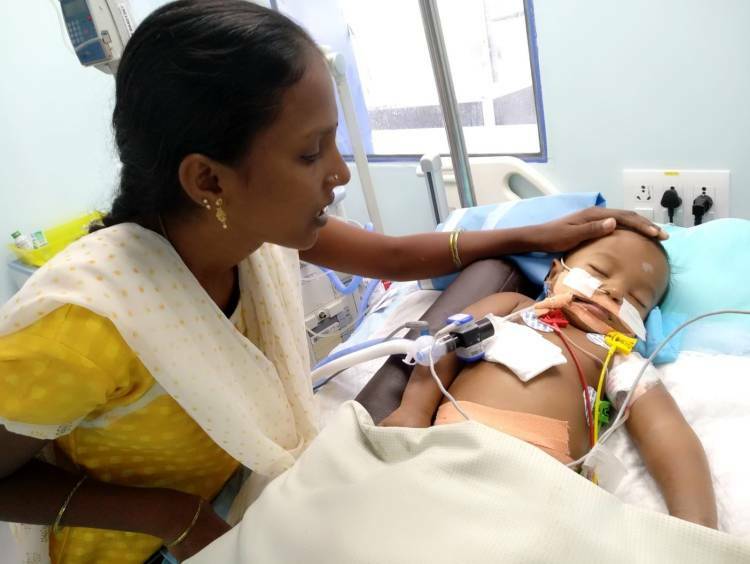 Little Yadesh is battling many a problem in the ICU. His kidneys have almost failed, for which he is undergoing dialysis since a few days. His liver function has also been compromised. He needs intensive care to recover. Suganya has been trying to elicit some kind of response from her baby for the past 9 days. Seeing him covered in tubes, eyes closed, has been very traumatic for her. She has not left the hospital since the past 9 days, and stays outside the ICU, hoping that her child opens his eyes and smile at her. 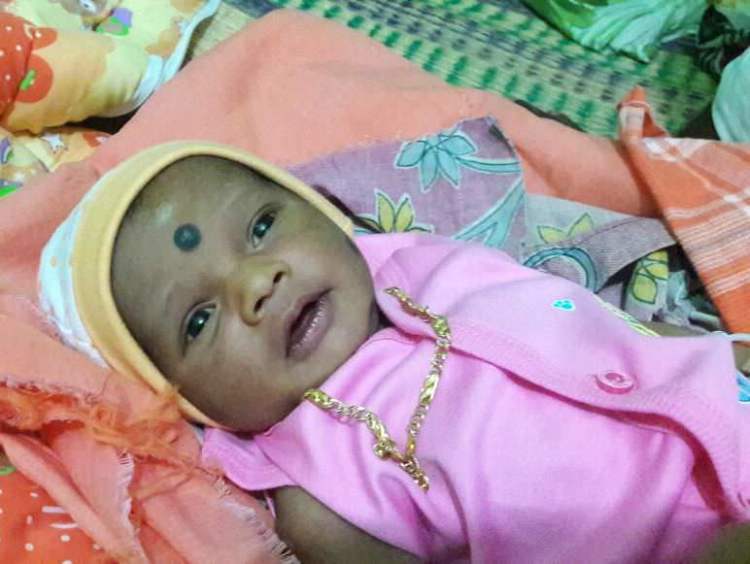 Baby Yadesh’s father, Raman, works as a mechanic in Chennai. He earns around Rs 7,000 a month. Yadesh’s medical expenses are too much for him to bear. He has no land that he can sell or mortgage. 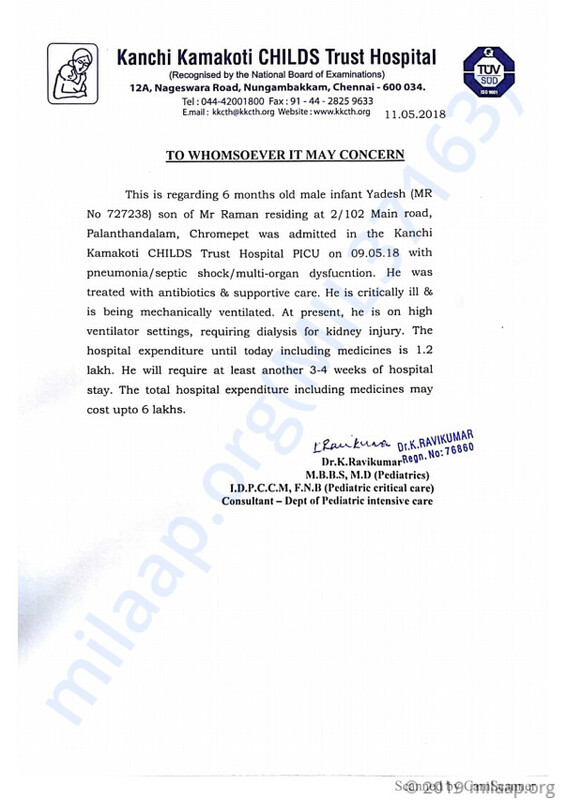 The bills have amounted to Rs 1.2 lakhs so far, and he has not been able to pay up even half of it. “My son needs 3 to 4 weeks more of ICU stay and more tests to determine what exactly caused his body to break down like this. We cannot afford the expenses but we cannot lose him. I will need to pay 100 times of what I earn in a month, how will I be able to do that? I hope kind people will help me”-Raman, tearfully. 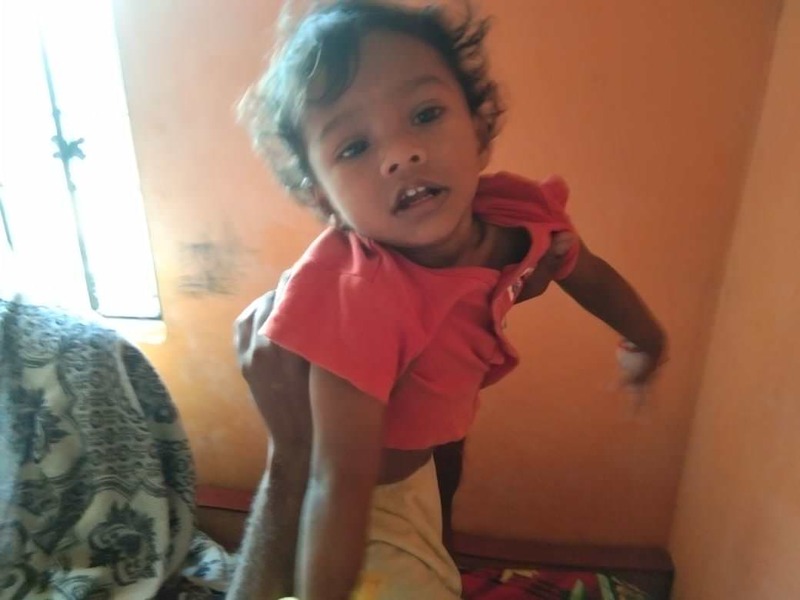 Your small contribution can save this baby boy. Yadesh is doing well. He is currently at home and is recovering. This wouldnt have been possible without you all. Here are few recent pictures of YAdesh. The baby is now doing well and has been discharged from the hospital. The doctors have observed some problems with the growth and are observing the baby closely. He is good and doing well and has been advised physiotherapy. The doctors have also prescribed medicines and the same is likely to continue for a while now. There will be regular follow ups also. I pray that you get well soon champ. I Wish speedy recovery for the baby.